In Curiosity-speak, a "bump" is a short drive the rover performs to better position itself for a particular science investigation (often contact science with the rover's arm). Yestersol's plan intended to include such a bump to reach a suitable target for contact science, but unfortunately the drive did not execute. Today's planning aimed to recover this drive and reach a target for contact science in the next plan. 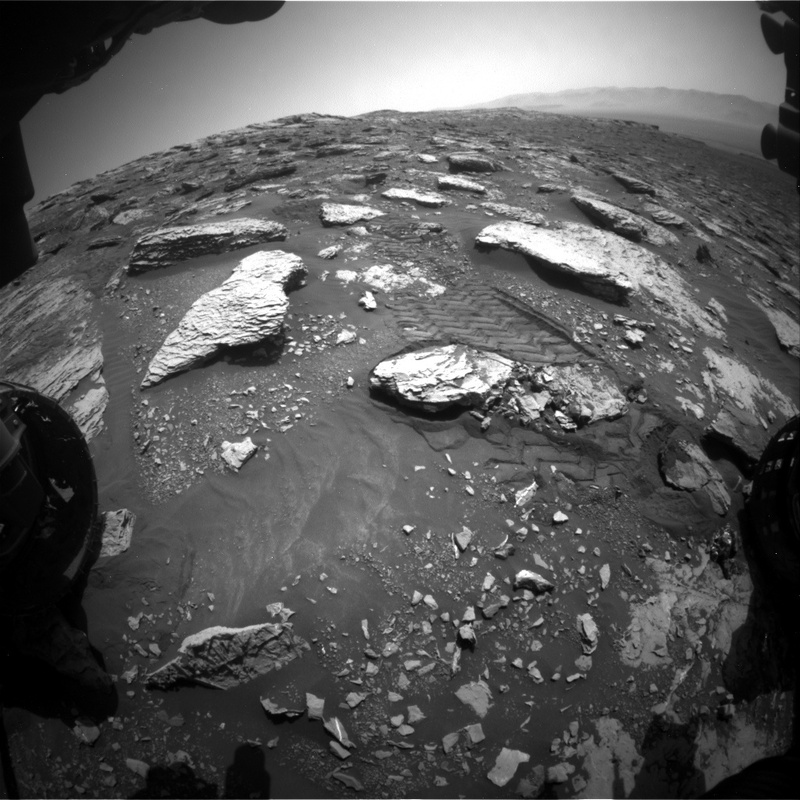 You can see from this Hazcam image that the ground is full of bedrock plates and tilted rocks, one of which Curiosity is standing on, which prevented contact science at the current location. The image also shows the northern edge of the Vera Rubin Ridge (from the upper left corner of the image extending horizontally across the upper portion of the frame). Curiosity will continue to head northward away from the ridge (toward the right side of the image) to find a target suitable for drilling. Today's science plan was necessarily limited and will include post-drive imaging, a dust devil movie, and routine REMS and DAN environmental monitoring.